Rosemary- and chilli-spiked rhubarb cuts through the richness of the trout beautifully. 1. Boil the sugar in 500ml water with the chilli and rosemary, until dissolved. Stir the rhubarb into the boiling syrup, take the pan off the heat and cover with cling film. Leave to cool for 15 minutes (or completely), then remove the rhubarb with a slotted spoon. Set both the rhubarb and syrup aside. 2. In a separate pan, heat the butter, vinegar, lemon, dill stalks and 500ml water. Once simmering, add the trout fillets and poach very gently for 5 minutes. Carefully remove the fish. 3. 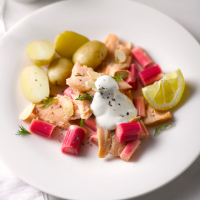 Divide the fish and rhubarb between plates, topping with the dill sprigs and a splash of the rhubarb syrup. Scatter over the almonds and finish with a blob of the soured cream (or yogurt). Serve, with new potatoes and lemon, if liked.